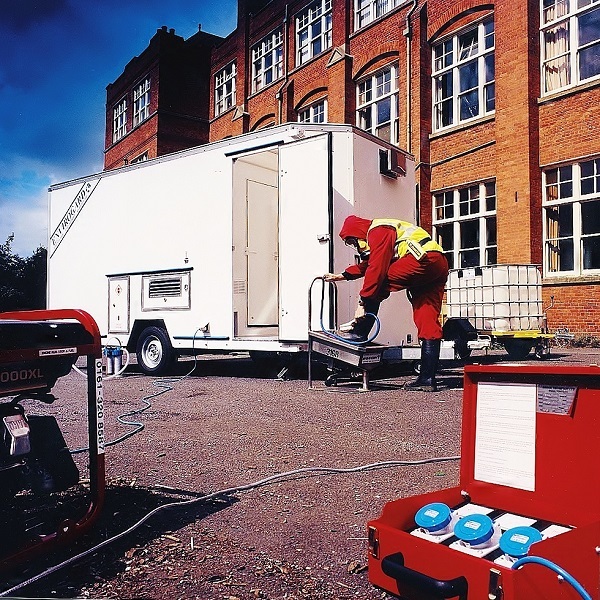 Envirogard's Solus and Nomad self-contained decontamination units were introduced specifically for sites without power or water. Designed and constructed in the context of H.S.E. 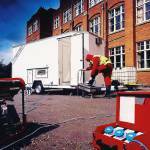 guidelines for provision of welfare facilities and decontamination showers, these units provide hygiene facilities for personnel working in and around contaminated sites. 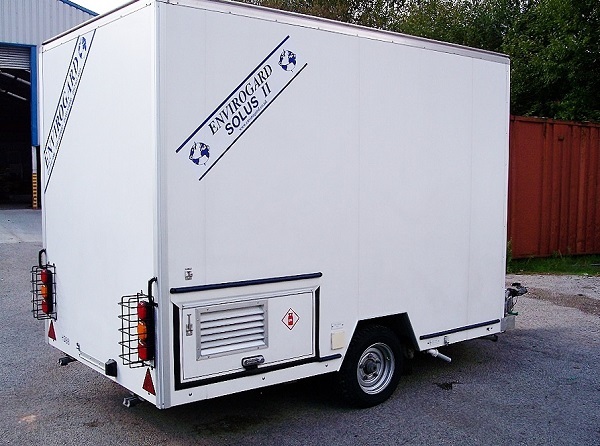 Unlike a static jack-leg unit they can be sited and re-sited without the need for a crane, and can be towed by most medium-sized vans or cars. The integral generator is fully enclosed for quiet operation, and LPG versions will run for approx. 50+hours on one 13kg propane gas cylinder. They are supplied with their integral clean-water tanks ready filled, and can be operating within 10 minutes of arrival at site. Where utility services are available you can take full advantage of this - these trailers will also accept an external water an power supply where available. For decontamination purposes there are three compartments which provide separate, designated, "dirty", "shower" and "clean areas", and thermostatically regulated showers provide safe and comfortable decontamination. A stainless steel wash basin is provided for full forearm cleansing and hot water is supplied by a LPG balanced flue water heater. An integral water tank supplies clean water for the shower(s) and wash basins, with a tank capacity ranging from 200 litres to 360 litres (model dependent). the trailer’s on-board clean-water supply tank. • a waste-water filtration unit to remove particulate matter before discharge to drain. Please note none of these trailers has a waste-water holding tank - users must arrange for appropriate disposal of waste-water at point of use, in accordance with local byelaws and regulations governing the users activity. Solus III: single shower + mess/office & galley kitchen in one trailer. Nomad II: twin shower unit that uniquely operates from 110v. All models can easily be connected to external utilities where these are available. The Solus I is a self-contained decontamination shower with a small footprint, allowing it to fit into a car parking space. Integral water tank 220 litres - suitable for tow to/from site with water tanks filled. The Solus II is a self-contained decontamination shower with a small footprint allowing it to fit into a car parking space. Compared with the Solus I it has the benefit of an additional shower (2 in total) and a larger integral clean-water tank capacity (250 litres). 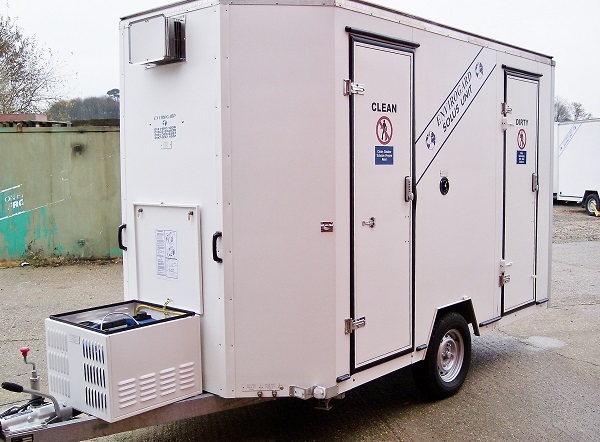 Self-contained single shower decontamination unit, with integral generator and 200+ litre water tank. Additionally features a separate mess / office area, plus galley kitchen [Microwave, Hotplate, Fridge, Sink] all contained in one trailer. A self-contained decontamination shower providing washing facilities for decontamination of personnel. Uniquely the Nomad operates from a 110v power supply - simply plug-in to a site supply (e.g. 110v 16A portable transformer) or utilise its own onboard 110v generator. Great for sites which lack any 240v supply, or which are sensitive about use of 240v trailing leads to supply equipment.